In all my years of working on old Mercedes diesels, I have never come across a 300TD wagon that I consider to have had proper and careful maintenance done on the hydraulic self leveling suspension system. Instead, what I often found were weeping hydraulic hoses, dirty hydraulic fluid, plugged fluid filters, leaking struts and leveling valve, collapsed accumulators and improper ride height. If you are willing to put out the effort I can help you fix it! Come on people, I know many consider this an annoying and expensive system to maintain, but if one neglects it, it is just going to get worse (and more expensive)! The SLS system is an amazing piece of engineering and when working properly, it can give amazing performance for a heavily loaded station wagon - and we all know they tend to get overloaded! If you feel you have to have a 300TD wagon and do not want to repair or maintain the SLS, then I would recommend you sell it and get a sedan instead. 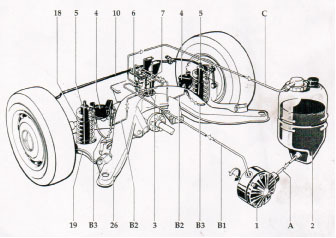 It is possible to remove the hydraulic suspension and replace it with regular springs and standard shock absorbers. Granted it is a cheap alternative the a full overhaul of the SLS system, but most who have tried this have not been happy with the conversion over the long haul. Why does one own a wagon in the first place - to haul large or heavy loads ?? If you put in heavy duty standard springs and shocks you will have a harsh ride when the wagon is empty and a bottoming out ride when heavily loaded aft of the rear axle. So once again - plan to maintain your wagon suspension or just get a sedan and tow a small trailer! That being said - and considering you the reader wants to learn how to repair and maintain an SLS - lets talk about what problems you may come across and how best to deal with them. I will start by listing common problems that are fairly easy and inexpensive to deal with. To properly troubleshoot the problem you must have a working knowledge of how each component works and what to look for when inspecting the system. Our guide Self Leveling Suspension Theory, Troubleshooting and Maintenance will walk you through how it all works, how to troubleshooting system malfunctions, common failure points, and routine maintenance and adjustment. 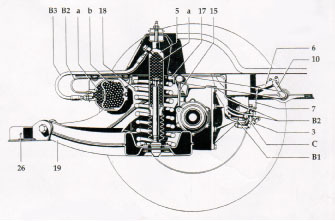 The SLS engine driven pump can leak both internally and externally. The manual described above will explain how to test if a pump is working. If your pump has not been run dry of fluid, it can be removed, opened up and resealed. If the pump is badly scored internally it can not be repaired. Before you start throwing money at replacing the SLS components it is very important to determine the unloaded right height of the wagon. This is explained in detail in my new SLS manual. You may be surprised to learn that many rear end sagging problems are caused not by worn struts or a malfunctioning leveling valve - BUT rather by worn out rubber suspension parts. If you want to restore your system properly start here by replacing those old rubber parts first. WARNINGS: Do not drive your wagon with the engine driven pump disconnected or removed. Also do not continue driving if the system drained of hydraulic fluid. 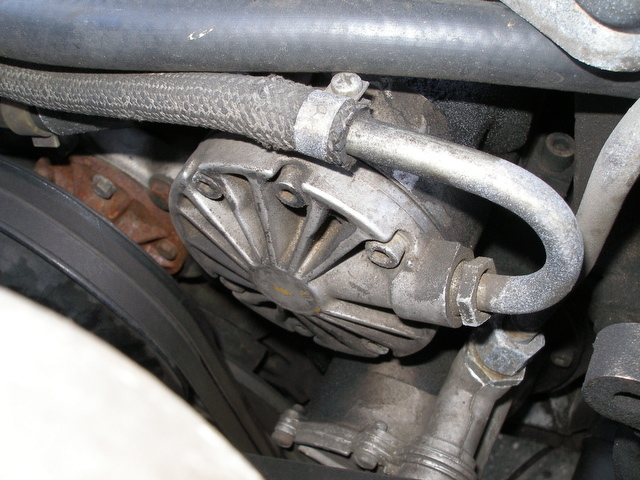 This can cause permanent damage to your hydraulic struts and leveling valve. If you spring a leak in the SLS system stop driving and have your car towed. Lack of hydraulic fluid in the pump can cause accelerated wear and possible seizure. New pumps are over $900.